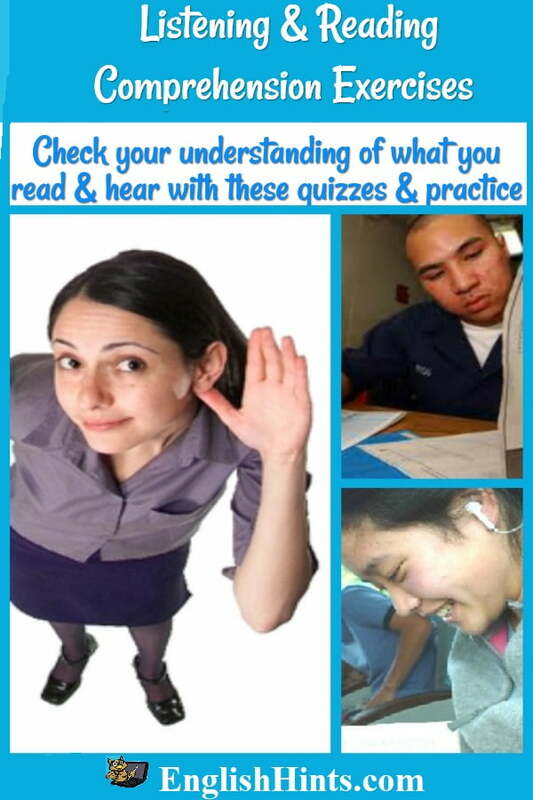 Listening and reading comprehension exercises can make a difference in your understanding of English. Reading and listening are essential to increase your vocabulary and fluency in English, but sometimes you need a way to check how much you understand. On this page there are several kinds of comprehension exercises on different subjects and at different levels. Choose the best for you! Many of the videos for the listening exercises also provide a transcript-- a written version of what you heard. This means that you can also use them for reading comprehension, as well as to improve your vocabulary (by both seeing and hearing new words-- often more than once). Your speaking fluency and writing will also improve as the rhythms of English become more and more familiar. In addition, some of the TED talks have subtitles or translation of the transcript-- or both-- into several common languages. You'll get the best English practice if you try to listen in English first, but you may be able to listen or read in your own language afterward to check and deepen your understanding of the message. You can find the videos and articles with their exercises below in the Listening or Reading Comprehension sections, each arranged from beginning to higher levels. At the bottom the same videos and exercises are arranged by topic: health and psychology, the environment, and society and social change. > ESL Lab. Lots of different subjects at several levels, these are mostly about everyday life, and include quizzes and optional related grammar exercises. He has another site, Daily ESL, that has short easy readings on daily life topics with listen-along audio. USA Learns has a number of entertaining videos following several families through different everyday experiences (working and looking for a job, renting an apartment, getting phone service, resolving family problems), along with different types of practice activities. Teachers may sign up a class, and the site will report individual student activities and quiz results. I used this site and their videos with several classes and loved it! The ongoing stories are easy to follow, and provide lots of repeat exposure to vocabulary and some grammar points. The British Council has several series of Elementary Podcasts with stories about everyday life and interactive exercises to practice what you have just heard. They have a lot of TED talks as well as songs, interviews, science and history articles-- even lesson plans, folktales, and an article on the greatest children's stories ever. Many selections also have exercises or quizzes for extra practice. > Lesson Plan on the Columbian Exchange includes a listening comprehension exercise. > Steve Jobs' 2005 Stanford Gradation Speech explains the idioms and less-common vocabulary he uses to help you understand this classic commencement address. > This ESL Listening Worksheet pdf has comprehension and discussion questions for an exceptional TED talk on "the Danger of a Single Story." > Newsela-- the same news report at diff rdg levels. They have a great variety of interesting articles, recent and older, some-- but not all-- with quizzes to check comprehension. They’re free, but you have to register. > Reading Comprehension Worksheet pdf on Education’s Death Valley (a TED video with transcript to read-- or you can listen to it by following the link). > Daily ESL.com: Short articles about daily life, so that after studying these you could use the words, common phrases, and ideas in conversation. There are audio recordings with them so you can also listen. > Reading Comprehension Lesson Plans. Understanding Nature and "Going Green"
For some suggestions on how to read English better, see ESL Reading and Reading Strategies Practice. For ideas for conversation and improving speaking fluency, see English Conversation Practice. There are lots of vocabulary exercises, along with games, at Vocabulary Games and TOEFL & IELTS Vocabulary. These strategies for better English reading comprehension emphasize questions to ask yourself before, during, and after reading a text or article in English. They help you focus on its most important ideas. 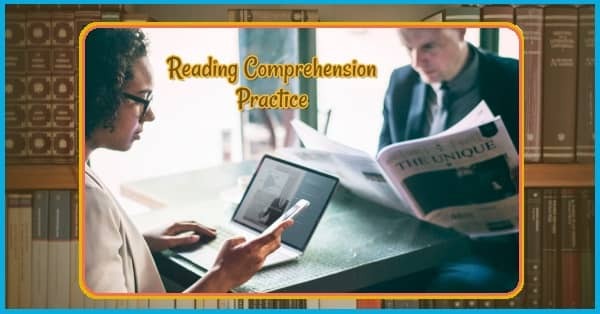 Learn important ways to improve your reading skills: how to skim and scan, decode words and use context clues, recognize sequence and transition words, and make inferences. You can find interesting online reading for almost any English level and need. Here are some good places to look.